High school football began in the late 19th century, concurrent with the start of many college football programs. In the late 19th and early 20th centuries, many college and high school teams played against one another. Today, the oldest high school football rivalry dates back to 1875 in Connecticut, between the Norwich Free Academy Wildcats and the New London High School Whalers. High school football traditions such as pep rallies, marching bands, mascots, and homecomings are mirrored from college football. No true minor league farm organizations exist in American football. Therefore, high school football is generally considered to be the third tier of American football in the United States, behind professional and college competition. It is the first level of play in which a player will accumulate statistics, which will determine his chances of competing at the college level, and ultimately the professional level if he is talented enough. In the 2000s and beyond, there has been growing concern about safety and long-term brain health, both regarding the occasional concussion as well as the steady diet of lesser hits to the head. A high school football game in Texas. The National Federation of State High School Associations (NFHS) establishes the rules of high school football in the United States. As of the next high school season of 2019, Texas is the only state that does not base its football rules on the NFHS rule set, instead using NCAA rules with certain exceptions shown below. Through the 2018 season, Massachusetts also based its rules on those of the NCAA, but it adopted NFHS rules for 2019 and beyond. If an attempted field goal is missed it is treated as a punt, normally it would be a touchback and the opposing team will start at the 20-yard line. However, if it does not enter the end zone, it can be downed or returned as a normal punt. Any kick crossing the goal line is automatically a touchback; kicks cannot be returned out of the end zone. The spot of placement after all touchbacks—including those resulting from kickoffs and free kicks following a safety—is the 20-yard line of the team receiving possession. Contrast with NCAA and NFL rules, which call for the ball to be placed on the receiving team's 25-yard line if a kickoff or free kick after a safety results in a touchback. All fair catches result in the placement of the ball at the spot of the fair catch. Under NCAA rules (but not NFL rules), a kickoff or free kick after a safety that ends in a fair catch inside the receiving team's 25-yard line is treated as a touchback, with the ball spotted on the 25. Pass interference by the defense results in a 15-yard penalty, but no automatic first down. Pass interference by the offense results in a 15-yard penalty, from the previous spot, and no loss of down. The defense cannot return an extra-point attempt for a score. Any defensive player that encroaches the neutral zone, regardless of whether the ball was snapped or not, commits a "dead ball" foul for encroachment. 5-yard penalty from the previous spot. Prior to 2013, offensive pass interference resulted in a 15-yard penalty AND a loss of down. The loss of down provision was deleted from the rules starting in 2013. In college and the NFL, offensive pass interference is only 10 yards. The use of overtime, and the type of overtime used, is up to the individual state association. The NFHS offers a suggested overtime procedure based on the Kansas Playoff, but does not make its provisions mandatory. Intentional grounding may be called even if the quarterback is outside the tackle box. The home team must wear dark-colored jerseys, and the visiting team must wear white jerseys. In the NFL, as well as conference games in the Southeastern Conference, the home team has choice of jersey color. Under general NCAA rules, the home team may wear white with approval of the visiting team. NFHS rules specifically prohibit the use of replay review, even if the venue has the facilities to support it. In Texas, the public-school sanctioning body, the University Interscholastic League, only allows replay review in state championship games, while the main body governing non-public schools, the Texas Association of Private and Parochial Schools, follows the NFHS in banning replay review. At least one unique high school rule has been adopted by college football. In 1996, the overtime rules originally utilized by Kansas high school teams were adopted by the NCAA, although the NCAA has made two major modifications: (a) starting each possession from the 25-yard line, and (b) starting with the third overtime period, requiring teams to attempt a two-point conversion following a touchdown. Thirty-four states have a mercy rule that comes into play during one-sided games after a prescribed scoring margin is surpassed at halftime or any point thereafter. The type of mercy rule varies from state to state, with many using a "continuous clock" after the scoring margin is reached (wherein, except for specific situations, the clock keeps running on plays where the clock would normally stop), while other states end the game once the margin is reached or passed. For example, Texas uses a 45-point mercy rule (to stop the game) only in six-man football; for 11-man football there is no automatic stoppage but the coaches may mutually agree to use a continuous clock. Most Canadian schools use Canadian football rules adapted for the high school game. The exception is British Columbia, which uses NFHS rules as used in the United States. Each state has at least one sanctioning organization for public schools. In many states a separate organization governs interscholastic athletics at most private schools. Each sanctioning body divides its member schools up into anywhere from two to eight size classifications based on the number of students enrolled at a school (so that schools are assured to compete against other schools of comparable size) and then each classification is further divided into geographic regions; the nomenclature and number of divisions vary from state to state. A school's size classification can change if its enrollment rises or declines over the years. At the smallest schools, particularly in rural communities or smaller private schools, variations on the game using six, eight, or nine players per side instead of the traditional eleven (or twelve in Canada) are encountered. Homeschooled students may also participate in high school football through independent or freelance teams, which compete against small private (or in a few cases, public) schools. In some states, such as Florida, state law allows homeschooled students to compete in interscholastic athletics for their local school district. Thus, homeschooled Tim Tebow, who was one of the top quarterback prospects in the nation, was able to play for the nationally ranked public Nease High School after he and his mother rented an apartment in that school district. Training for the upcoming season usually starts with weightlifting and other conditioning activities, such as specialized speed and agility training. In some states, this begins a few weeks after the end of the previous season, and in others as late as August. Some states allow seven on seven scrimmages, while others prohibit formal practices during most of the summer. Near the end of the summer in mid-August, double sessions tend to begin and usually last for one week or until school starts. After double sessions end, regular season practices begin with daily sessions each week day afternoon except on game day. Practices are often held on Saturday as well, but almost never on Sunday. The regular season typically consists of ten games in most states; Kansas is one of the few states which limits teams to nine. Teams in Minnesota usually play eight, while teams in New York typically schedule only seven. The first game of the season is usually in early September, or late August, and the final regular season game is usually in mid to late October, with the end of the season varying by state and climate. Teams may have one or more bye weeks during the regular season. Larger schools (especially those with successful programs) can often draw attendances in the thousands, even for regular season games, and in some cases may play the game at a college or professional stadium to accommodate the expected large crowds. The vast majority of high school football games are scheduled on Friday nights, with Thursday evenings and Saturdays being less heavily used. Alternate days are most common in larger school districts where the facilities are used by multiple schools, or where the playing field is not illuminated for nighttime use due to financial limitations, local regulations, or neighborhood opposition against night games. Prior to the 1970s, many states crowned state champions through polls, but playoff systems have become nearly universal. Since then, most states have steadily increased the number of teams eligible to participate and total number of classifications. Though the playoff scheme and number of teams eligible varies, regional champions will compete in elimination playoff rounds – in a tradition borrowed from pro football rather than college – to determine a state champion for each size classification. Only one state, New Jersey, does not crown state public-school champions, only determining regional state champions, but does crown state champions for non-public schools. Massachusetts did not establish a state championship until 2014, previously crowning only regional champions as in New Jersey. New York's championships are nominally statewide, but only include upstate New York because the divisions representing New York City and Long Island (which cover the majority of the state's population) abstain from the state tournaments. In many large cities, including Pittsburgh, New York City, and Los Angeles, as well as some very small districts in places such as Western New York, public high schools compete in their own "city leagues" and may or may not ever play opponents outside of them. At the other extreme are states such as Illinois, Louisiana and West Virginia, in which regional championships do not exist; the state's playoffs are seeded on a statewide basis. The championship games are usually held at a neutral site, usually a college or NFL stadium needed to accommodate the larger crowds. College and professional fields are also usually better equipped to handle inclement weather which is common since state championship games are typically held in late November to the middle of December. In the vast majority of states, all championship games are played at one site, such as the UNI-Dome in Iowa, War Memorial Stadium in Arkansas, Pratt & Whitney Stadium in Connecticut, Camp Randall Stadium in Wisconsin, Mercedes-Benz Stadium in Georgia (formerly the Georgia Dome), Ford Field in Michigan, the DakotaDome in South Dakota, Kroger Field in Kentucky, the Mercedes-Benz Superdome in Louisiana, Lucas Oil Stadium in Indiana, Memorial Stadium in Nebraska, the Carrier Dome in New York, and AT&T Stadium in Texas. Alabama previously played all of its championship games at Legion Field, but at the urging of Alabama Crimson Tide coach Nick Saban, the games now alternate between Bryant–Denny Stadium in Tuscaloosa and Jordan–Hare Stadium in Auburn. Mississippi, which previously held its games at Mississippi Veterans Memorial Stadium in Jackson, has done the same, alternating between Vaught–Hemingway Stadium in Oxford and Davis Wade Stadium in Starkville. Kansas, Oklahoma, Colorado, Idaho and New Mexico are among the states which play only one championship game per site. The current record for number of state high school football championships is held by Washington High School in Sioux Falls, South Dakota, which is 37 as of 2010. Some publications and internet sites release nationwide rankings based on polls or mathematical formulas which take into account various factors like average margin of victory and strength of schedule. Schools that finish atop these rankings, particularly the USA Today poll, are sometimes considered to be the national champions. Outside of the playoff tournaments, high school football on Thanksgiving has also historically been popular; originally the traditional end of the high school football season, Thanksgiving football has become less common because of state tournaments (it is still widely popular in some states, particularly in New England). Because of its overlap with the playoff season, many teams forgo their rights to a playoff tournament to participate in exhibition rivalry games that are held over Thanksgiving weekend. Others will play a rivalry game only when they do not qualify for the playoffs. Many of the state championship tournaments are purposely scheduled to conclude on the weekend of Thanksgiving. In Ontario, high schools play in bowl games similar to college football in the United States. Until 2012, the games were determined by geographical location as opposed to a team's record. There were five bowl games for five different geographical regions; the Northern Bowl, the Golden Horseshoe Bowl, the National Capital Bowl, the Western Bowl and the Metro Bowl. For instance, the National Capital Bowl champion is determined through contests between teams from the Bay of Quinte, Simcoe County, Kawartha Lakes, Ottawa Valley and East Ontario. East Ontario or EOSSAA (Eastern Ontario Secondary School Athletic Association) champion is determined by the champions from divisions within itself such as KASSAA (Kingston Area Secondary School Athletic Association). Since 2013, the Ontario Federation of School Athletic Associations has held an annual bowl game series at Tim Hortons Field in Hamilton, Ontario featuring random pairings between the champions of the OFSAA's 18 member associations. Since 2015, the festival has featured nine bowls: Western Bowl – SWOSSAA/ WOSSAA, Golden Horseshoe Bowl – GHAC/ SOSSA, Metro Bowl – TDCAA/ TDSSAA, Central Bowl – CWOSSA/ ROPSSAA, Simcoe Bowl – GBSSA/ YRAA, National Capital Bowl – NCSSAA/ EOSSAA, Northern Bowl – NOSSA/ NWOSSAA, Eastern Bowl – LOSSA/ COSSA, and Independent Bowl – CISAA/ 2nd Entry with one of two associations drawn to compete one year, and the other automatically competing in that bowl game in the following year. The remaining nine associations are drawn by lottery to determine their pairing. Other provinces typically divide schools by size and hold playoffs in a similar manner to those contested in US states. All DoDEA Europe high schools offering football will participate in regular season competition facing their Division opponents. In Division I the top four teams at the end of the season will advance to the semi-final games with the winners of those games advancing to the championship game. Division II will be divided into two conference with the top 4 in each conference participating in quarter-final matchups, with the winners advancing to the semi-finals and the final two teams remaining participating in the championships. The FINAL FOUR Championships will be held in the Kaiserslautern Military Community following the play-offs. Many larger high schools also have a separate junior varsity team along with their regular or varsity team. In many cases, these teams – sometimes called the "sophomore team" – are made up of sophomores and some freshmen, although some underclassmen will be called up to play varsity, especially to replace injured varsity players or if the underclassman player is exceptionally talented. At larger schools, there often will be a third team for freshmen (called the freshman team) or, in unified school districts, a "modified" team that includes freshmen and middle school students. Typically, there are no playoffs for junior varsity teams, although many leagues will award a championship title to the team with the best record. Overtime rules are often disregarded, meaning it is possible for games to end in a tie. Junior varsity teams usually have the same schedule as the varsity, with many games played on the same night and at the same site as the varsity game, with the JV game serving as a preliminary contest before the varsity game. Some schools also field a true junior varsity team, which are simply made up of junior and senior players who typically do not see playing time in the varsity game (except during the final minutes of a one-sided game); some freshmen and sophomores will also play in these games, as will a few juniors who start but either are playing in a different position or will be expected to have leadership roles as seniors. In addition to providing opportunities to play in a timed contest, coaches may use these types of contests to see how well underclassmen and juniors play together, since they would replace varsity players lost to graduation; and to assess the talent and actual game-situation abilities of those players who rarely get to play in varsity games. While sometimes these games will be played on the same night as varsity games, true JV teams often play on a different night and may have a separate schedule composed of conference and non-conference teams. In all states, the HS football season will have ended by late December, but the recruiting process by which colleges offer scholarships to high school seniors often starts in the summer, before the school year and football season begin. Physical assessment is an increasingly important part of the recruiting process. Football camps are held at college campuses where a large number of potential recruits can be evaluated simultaneously in various speed and skills drills. Players are evaluated based on running the 40-yard dash, agility shuttle, vertical jump and the number of repetitions on the bench press that they can perform at a given weight. Recently, the SPARQ rating has become a popular composite metric to evaluate overall athleticism. Based on performance over the course of their careers and at camps, colleges will typically take potential recruits on tours of the campus and athletic facilities, or the college may have its team's coach visit the recruit at home or at school. While all colleges do much of their recruiting from local and in-state high schools, where they can network with HS coaches and booster clubs, the nation's top college programs can easily recruit athletes from around the country. Some colleges have historically been aided in this regard through their prominence within their religious affiliation, such as Notre Dame or BYU. Students who played for larger high schools, or who competed in nationally televised matches, have a natural advantage towards recruitment, while players who competed at smaller schools – such as most states' 1A and 2A categories – or in states where high school football is not perceived as being of a high caliber will have their skills and achievements judged versus the lower-caliber opposition they faced and, as such, are rarely considered as top prospects. Occasionally, though, a student at a smaller school will receive a full scholarship; an extreme example of this is Jehuu Caulcrick, a fullback who received a full scholarship to Michigan State University despite playing high school in Clymer, New York, one of the smallest school districts in the state (and a state where high school football is not seen as particularly high caliber). Caulcrick went on to have a successful college career and several years as a journeyman professional, ending his football career as a member of his hometown team, the Buffalo Bills. Though it is an expensive project, high school football players often increase their visibility by sending out video highlights of their playing skills to college recruiters. If a student receives no scholarship offers, they may still attempt to make a college team by becoming a "walk on" and paying their own tuition in the hopes that they can make the team and possibly receive a scholarship. Others will try out for a non-scholarship team, such as a Division III school, or a two-year junior college team. The latter option is also popular with students with academic or behavioral issues that would prevent them from playing at a four-year college. While the vast majority of high school football players will not even be considered for a scholarship offer, players who receive nationwide attention will invariably receive scholarship offers from more than one school and will often hold a press conference to announce their final selection. "All Star" exhibition games like the U.S. Army All-American Bowl, which is televised nationally by NBC, give the nation's top prospects the opportunity to publicly announce their college selection or to provide one last opportunity to showcase their talents to college recruiters. By National Signing Day, the first Wednesday in February, most top recruits will have already signed non-binding letters of intent or verbally committed with colleges. A number of all-star football games are played among high school football players in the United States. The caliber of these games varies widely; games such as the aforementioned U.S. Army All-American Bowl tend to draw some of the most renowned high school players in the country, while smaller regional contests such as the Big 30 All-Star Football Game may only draw from a small region. The International Federation of American Football sponsors the biennial U19 World Championship for high school-aged players around the world. As with all IFAF tournaments, players play for national teams; the U.S. and Canada national teams have alternated as champions and runners-up throughout the tournament's existence. As with college and professional football teams, most high school teams in every state have a mascot or team name. Many are generic allusions conveying an image sense of strength, speed, or bravery. Thus, pluralized team names such as Tigers, Eagles, Wildcats, Trojans, and Warriors are fairly common throughout the country. Other team names, however, have a historical connection to the town or area where the high school or school district is located, such as a locally important industry. For example, Yuma High School in Yuma, Arizona is known as the "Criminals" due to the school's historic connection to the infamous Yuma Territorial Prison. Many new schools, or schools that had merged with other schools, have allowed their students to "vote" on a new school mascot or team nickname. Because of high school football's mostly limited regional appeal, and because most games take place during prime time (albeit during the Friday night death slot), television exposure of high school football on both a local and national basis tends to be limited to championship games only, or for the regular season to the lower-tier stations in a market such as a MyNetworkTV affiliate or independent television station where no critical programming would be pre-empted, where the game chosen for coverage may be put up to a public vote. Local public access cable television and local radio stations often air regular season contests, and in some cases, the school's own radio station (or a nearby college) broadcasts the game using student announcers. One such example is San Diego's Prep Pigskin Report. 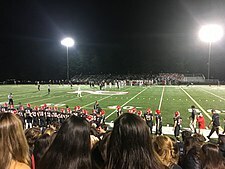 High school football is often an integral part of the modern full service radio format, which centers on local information; radio's prime times are traditionally earlier in the day, and there is far less risk of preemption, since many stations would otherwise be automated or off the air during the times high school football games are played, or air much less popular evening talk shows. There has also been a marked increase in recent years of web-based media covering high school sporting events. Examples include Mid America Broadcasting in Indiana, Champs Sports Network and MSA Sports Network in Western Pennsylvania, MSBN in Minnesota, and BSports.org in Washington. In many television markets, local stations will air 30 or 60-minute 'scoreboard' shows following their late Friday newscast with scores and highlights from games in their coverage area. Many national media outlets have been producing national high school football rankings, including High School Football America, which has been releasing its Top 25 since 2011. Despite increased national media attention, some states restrict the broadcast of high school games. One example is the University Interscholastic League, which governs public school sports in Texas. The UIL has a long-standing ban on television broadcasting of high school football games on Friday nights, believing that doing so could hurt ticket sales (radio broadcasts are allowed, though). Because of this, several games that have been broadcast on ESPN and Fox Sports Net in recent years have had to be played on either Thursday night or on Saturday to avoid the UIL's ban. The Sports Broadcasting Act of 1961 and Public Law 89-800, which govern the antitrust exemptions given to the National Football League, prohibit the broadcasting of NFL games within 75 miles of any high school football game on Friday nights between September and early December. Because most populated areas of the United States have at least one high school football game within a 75-mile radius, and because broadcasting is an integral part of the NFL's business model (roughly half of the league's revenue comes from television contracts), this effectively prohibits the playing of NFL games in competition with high school football. (These rules do not apply during preseason, when Friday night games are common, nor does it apply at the end of the season, though the only time regular season games are played on Friday in the NFL is on Christmas.) Only recently have national sports television channels fully capitalized on this rule; since 2005, the ESPN family of networks (usually the sub-networks ESPN2, ESPNU and online broadcaster ESPN3, although the main channel also shows occasional games) has aired regular season matchups between nationally ranked teams under the High School Showcase banner. Fox Sports 1 also included high school football in its lineup when it launched in 2013. All the Right Moves – A 1983 film about a western Pennsylvania football player desperate to earn the scholarship that would enable him to escape his economically depressed town. American Dreams – "JJ" Pryor is a star high school football running back in the show, and many of the early episodes centered on his games. Quarterback Princess – starring Helen Hunt. A movie based on a small town girl whose family moved into a football town and becomes the local high school's starting quarterback. The Best of Times – A 1986 film based on an actual rivalry and game between small town Taft High School Rockets (Wildcats) and the larger and highly successful Bakersfield High School Tigers (Drillers) who actually have the California high school record for most wins, most section titles, and most State titles. Bleachers – A novel published in 2003. It tells of the fictitious Messina High School football team and its coach, Eddie Rake. Rake with 418 wins, 61 losses, and 13 state championships under his belt is on his deathbed, and many of his former players return to Messina to say goodbye. The Blind Side: Evolution of a Game – A 2006 book by Michael Lewis, partly on the evolution of the offensive left tackle position and partly on the life of Michael Oher, including his high school career, his adoption by Sean and Leigh Anne Tuohy, and his college recruitment. The book spawned the 2009 film The Blind Side, which focused more on Oher; Sandra Bullock won an Oscar for her portrayal of Leigh Anne Tuohy. Dazed and Confused – A 1993 film set in Texas in 1976. It is not a true high school football movie, but the main character Randy "Pink" Floyd, played by Jason London, is the starting quarterback at his high school and most of his friends play football as well. Facing the Giants – A 2006 film revolving around high school football coach Grant Taylor and his issues on and off the field. Fast Times at Ridgemont High – A 1982 film not specifically about football, but whose minor character Charles Jefferson is a football star. During a big game, Charles unleashes his fury on rival "Lincoln High School", as he supposed Lincoln students had vandalized his prized car (actually the result of reckless driving by Ridgemont's Jeff Spicoli). Friday Night Lights: A Town, a Team, and a Dream – a book about the 1988 season of Permian High School in Odessa, Texas as they made a surprising run toward the state championship. In the end, however, the underdogs lost in the state semi-finals to Carter High School of Dallas. This book directly spawned two other media properties. Friday Night Lights – A 2004 film whose plot is very similar to that of the book. Friday Night Lights – A television series that aired 2006–2010, and was inspired by the above film. Carter High – A 2015 film dramatization. What Carter Lost – A 2017 documentary that aired as part of ESPN's 30 for 30 series. Go Tigers! – A 2001 documentary on the rivalry between two Ohio high school teams: Massillon Washington High School and Canton McKinley High School. Gridiron Gang – A 2006 film about using football to rehabilitate juvenile delinquents. Johnny Be Good – A 1988 comedy film about the pressures of recruiting. Lucas – A 1986 film about the coming of age of a small, intellectually gifted boy; one subplot revolves around his efforts to join the school's football team. Married... with Children – A 1987–1998 TV series which featured Al Bundy, a middle-aged, Chicago-area shoe salesman whose lifelong claim to fame was playing running back at (fictitious) Polk High and scoring "four touchdowns in one game." Must Win: A Season of Survival for a Town and Its Team by Drew Jubera published in 2012. Valdosta High School in Valdosta, Georgia. Radio – A 2003 film based on the true story about T.L. Hanna High School football coach Harold Jones and a mentally challenged young man James Robert Kennedy, nicknamed "Radio", who becomes the team manager. Remember the Titans – A 2000 film based on the actual story of the 1971 team of T. C. Williams High School in Alexandria, Virginia. The Season – a 1999 ESPN television documentary of eastern Pennsylvania's North Penn High School. Two-A-Days – MTV reality television documentary about the 2005 and 2006 football seasons at Hoover High School in suburban Birmingham, Alabama. Varsity Blues – A 1999 film about high school football in a small Texas town, and the coach obsessed with winning. When the Game Stands Tall – A 2014 film about the record-setting 151-game 1992–2003 high school football winning streak by De La Salle High School (Concord, California). Wildcats – A 1986 film in which Goldie Hawn plays the daughter of a noted football coach who becomes head coach at an inner-city high school. Woodlawn – A 2015 Christian-themed film surrounding the 1973 desegregation of Woodlawn High School in Birmingham, Alabama, and a spiritual revival within the school's football team that significantly affected the community. Robert Cantu, a Professor of Neurology and Neurosurgery and Co-Founder of the CTE Center at the Boston University School of Medicine, believes that children under 14 should not play tackle football. Their brains are not fully developed, and myelin (nerve cell insulation) is at greater risk in shear when the brain is young. Myelination is completed at about 15 years of age. Children also have larger heads relative to their body size and weaker necks. Chronic traumatic encephalopathy (CTE) is caused by repeated brain trauma, such as concussions and blows to the head that do not produce concussions. It has been found in football players who had played for only a few years, including some who only played at the high school level. An NFL-funded study reported that high school football players suffered 11.2 concussions per 10,000 games or practices, nearly twice as many as college football players. ^ a b Toporek, Bryan. "New: High School Football Can Lead to Long-Term Brain Damage, Study Says". Education Week. Archived from the original on August 2, 2017. Retrieved August 26, 2017. ^ "2018–19 Football Manual" (PDF). University Interscholastic League. Retrieved January 21, 2019. ^ "Section 159 – Football Rules". TAPPS Constitution. Texas Association of Private and Parochial Schools. Retrieved January 21, 2019. ^ "Rule 69.1" (PDF). Rules and Regulations Governing Athletics. Massachusetts Interscholastic Athletic Association. July 1, 2009 – June 30, 2011. Archived from the original (PDF) on November 16, 2009. Retrieved July 28, 2009. ^ "MIAA Aligns Rules with NFHS in Football, Volleyball & Baseball" (Press release). National Federation of State High School Associations. August 8, 2018. Retrieved January 21, 2019. ^ "BCFOA Home". British Columbia Football Official's Association. Archived from the original on September 13, 2010. Retrieved September 1, 2010. ^ "High Schools – The Buffalo News". blogs.buffalonews.com. Archived from the original on December 2, 2011. Retrieved November 27, 2011. ^ McShea, Keith (November 3, 2011). The Ralph is a busy place for football playoffs Archived November 6, 2011, at the Wayback Machine. The Buffalo News. Retrieved November 3, 2011. ^ National High School Record Book. NFHS. p. 76. Archived from the original on September 27, 2011. Retrieved November 12, 2010. ^ SDPB Championships. South Dakota Public Broadcasting. Archived from the original on April 25, 2012. Retrieved October 24, 2011. ^ "OFSAA Football Bowl 2015 Matchups – Ontario Federation of School Athletic Associations". www.ofsaa.on.ca. Archived from the original on October 3, 2017. ^ Nader, Ralph; Reed, Kenneth (November 8, 2016). "The X's and O's of brain injury and youth football". Chicago Tribune. Archived from the original on August 27, 2017. Retrieved August 26, 2017. ^ Cantu, " Concussions and Our Kids"
^ "Deadly Hits: The Story of Ex-football Player Chris Coyne". Lauren Tarshis YouTube page. Lauren Tarshis. September 21, 2012. Archived from the original on May 28, 2017. Retrieved August 27, 2017. ^ Preps at greater concussion risk Archived November 4, 2013, at the Wayback Machine, ESPN, Tom Farrey, October 31, 2013.